Are you still detoxing from all the carb loaded Holiday foods? We definitely are! 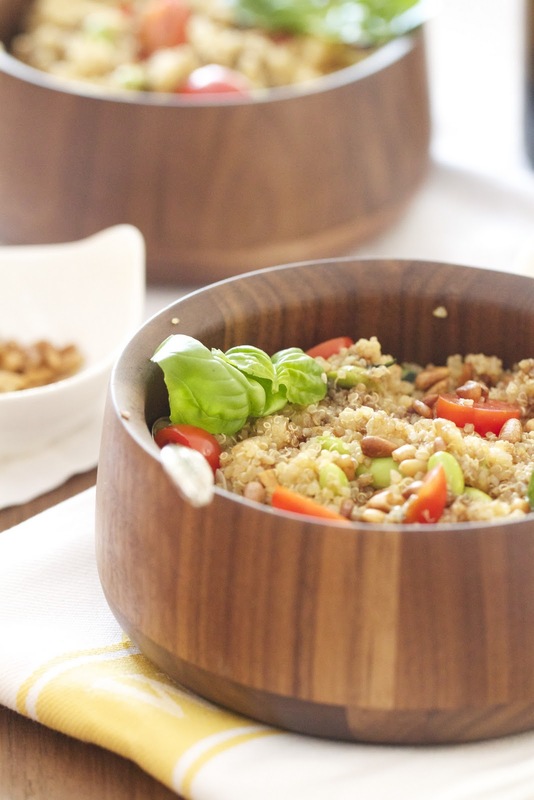 The nutty quinoa seeds are a healthy and gluten-free alternative to grains. 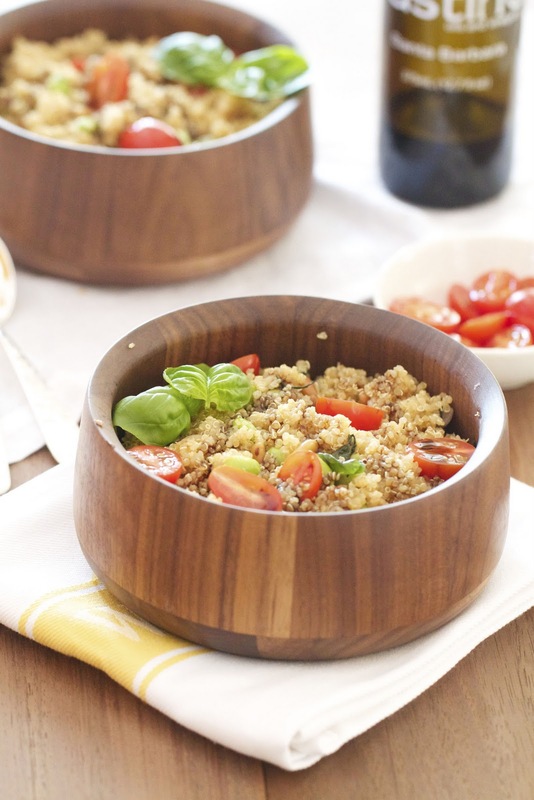 Almost any fruit or veggie you mix with quinoa will be tasty! The versatility is endless! Have I sold you yet?? I added the basil to the slightly cooled quinoa, in order to wilt it and tossed it with toasted pine nuts. My hubby couldn't get enough of it. He came back for seconds, thirds, fourths! My kids? Well, let's just say I need to slowly introduce more quinoa to them! Make this...tonight! Your body and self will thank you! In a medium saucepan over med-high heat combine rinsed quinoa and veggie broth. Bring to a boil and reduce heat to low and simmer for 20-25 minutes, until broth is completely absorbed. Set aside to cool for 5-10 minutes, add basil and fluff. In a small skillet over medium heat combine avocado oil, garlic and onions. Saute for 10-15 minutes, until caramelized. Set aside to cool. Combine all ingredients, except for the aged balsamic and basil leaves, in a salad bowl. 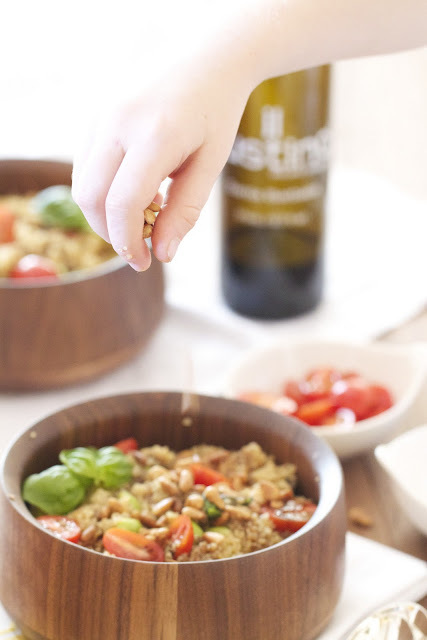 Toss and spoon into serving bowls, drizzle aged balsamic over salad and garnish with basil leaves. This looks fantastic Katie, and so healthy and delicious! I really need to cook more with quinoa. Thanks for the reminder. Fabulous recipe! I love Quinoa. It has been a slow introduction with my kids too. I keep playing with variations to hopefully find one they like! Looking forward to trying this delicious recipe. Looks beautiful and oh so light. Yay! I am still detoxing, for sure! We had our last holiday celebration this weekend (thank goodness!) I love quinoa too, this is beautiful! I have a feeling I'll be detoxing for quite a while and quinoa is the perfect addition to my life! This salad sounds delicious! Quinoa has been a big hit in my house as well, love that slight nutty taste and fluffy texture. This looks delicious...I have to make this. I've been looking for a recipe just like this. I've got half a box of unmade quinoa in the pantry- time to bust it out! I still have not made my own quinoa at home - so I am glad that you posted your fave quinoa recipes. I'd better get on it :) Thanks for sharing. This looks so fresh and inviting. I love eating quinoa like a rice dish. This one would be right up my alley. I love the nuttiness of quinoa. Although I did try the quinoa noodles and really disliked them. Not sure if making my own would change that.